Kilroy needs students for many things. He needs them to do outreach, to come on retreats, to participate in the Center for Ministry and Service’s high school mentoring program—to take part in building the Regis community. “It’s the only way to get this done,” Kilroy says. “This” meaning his ministry. He calls it “eyeballing”—meeting students face-to-face. His style of ministry has paid off in more ways than one. When Matt Norton ’17 had doubts during freshman year, the Weymouth, Massachusetts, native talked with Kilroy, who encouraged him to stick it out—get involved. At Kilroy’s urging, he joined the Student Government Association. As a junior and now senior, Norton has served as SGA president. He became a Pride Guide, giving campus tours to prospective students, which he still does. A runner, he was already on the cross-country and track teams. “Now I can’t imagine not being here at all,” Norton says. When Marcos Aguirre ’18 from Los Angeles felt like he was in a “rough place in my life” his sophomore year, he turned to Kilroy. 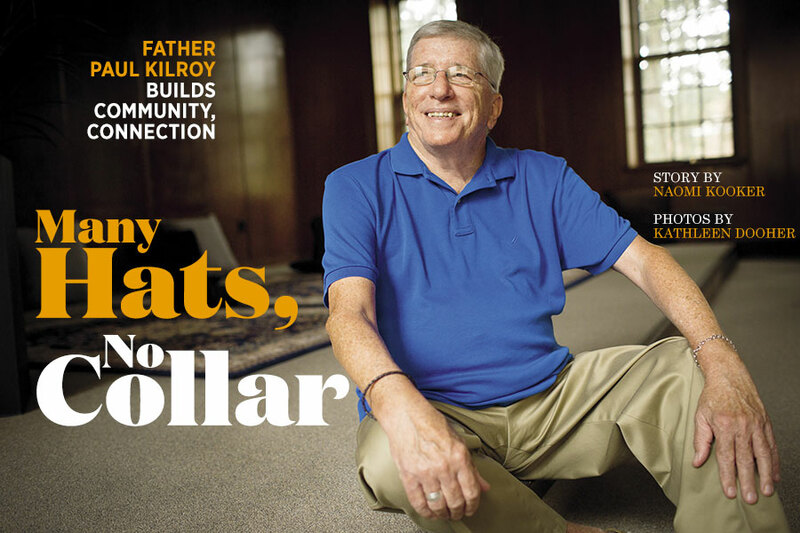 Affectionately known as “Father Paul,” Kilroy has been a rock, confidant, cheerleader, spiritual leader, and, well, a father figure to many a Regis student. Since becoming chaplain in 2007, in part to ease the transition from an all-women to a coed campus, Kilroy has helped countless Regis students find their way as budding young adults. 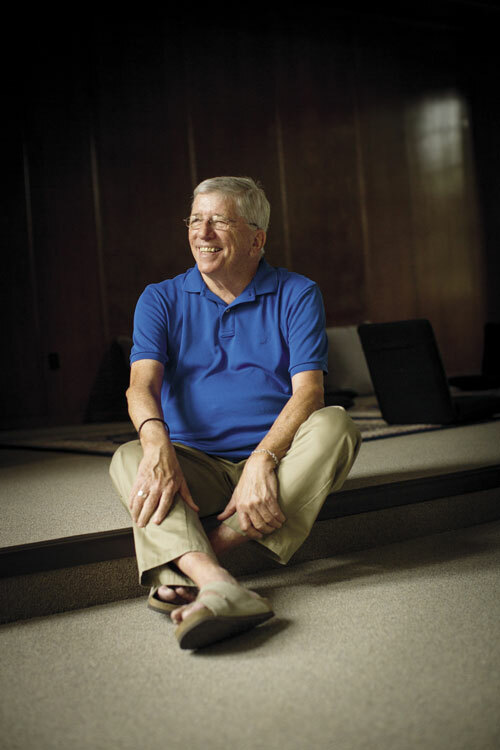 For nearly 10 years Kilroy has led convocations in prayer, greeted freshmen at orientations, and lit up students’ faces with an enthusiastic, “Better for seeing you!” after they ask how he is. The Center for Ministry and Service (formerly Campus Ministry)—grounded in the values of the Sisters of St. Joseph of Boston, Regis’ founders—is central to his work. Located in St. Joseph Hall, its mission is to foster and develop the spiritual life of students, faculty, and staff. While preserving a rich Catholic heritage, the purpose is to provide opportunities for persons of all faiths to grow spiritually. Kilroy has a number of projects in the works: Making the center more visible and establishing a Peace Room and a community around the Peace Pole are a few items recently on the agenda. But his main work is with students, helping them build a bridge from adolescent faith to young adult faith. “I won’t get to adult—not quite there yet,” he says. “But I want to get them on that bridge. As a freshman, Stanley Onyeneho ’14 remembers Kilroy as always smiling as he passed him in the hall. “He is a kind, charismatic person,” says Onyeneho, now a graduate intern in the Office of Student Programming and Leadership. Kilroy takes his work seriously, but not too seriously. He’s the one donning a hard hat at Baccalaureate to connect the students’ enduring loud construction on campus with the ongoing construction of their lives post-graduation. He’s the one handing out “The Complete Idiot’s Guide to Understanding Catholicism” to students as confirmation gifts. Laughter punctuates his exchanges not only with students, but with faculty and staff. His laid back yet energetic demeanor coupled with his down-to-earth straight shooting makes him a perfect personality to heed the needs of college students in the throes of constant change, self-exploration, and growth of an inward and outward kind. Kilroy grew up in the Boston neighborhood of Dorchester, thick in the Irish Catholic ways of the time. Ordained a Catholic priest in 1970 on the heels of Vatican II, a revolutionary time in the Catholic church, Kilroy knows a thing or two about growth and change. His college experience came at a time when young seminary students were reflecting on their own identities as men and as spiritual leaders, and questioning beliefs in the Catholic tradition that hadn’t been examined for centuries. Today, he is doing that through campus projects. Over the summer, in an answer to escalating gun violence and the police officers killed in Baton Rouge, Louisiana, Kilroy spearheaded the installation of a Peace Pole. Surrounded by a circle of rocks under a canopy of leafy branches at the far end of the quadrangle near the Student Center (formerly known as Alumnae Hall) stands a white pole with black lettering in different languages that reads, “May peace prevail on Earth.” Every Thursday from 12:05 to 12:15 p.m. Kilroy offers a quiet prayer for anyone who wants to come. “The point of praying is in terms of peace in your life, the world, and the Regis campus—what we need to pray for that day,” he says. To serve the multi-faith community that Regis is—many students who attend Regis are not Catholic—the Peace Room, a large room adjacent to the center, is a quiet safe haven to sit, reflect, and find solace. Then there is the grotto, an outdoor refuge hidden between the Regis Tower near Walters Hall. Stone steps lead to it from the left of the Tower, revealing a statue of the Virgin Mary set in a stone arch. A manicured lawn and plantings show care for the natural setting once used by the Sisters. Kilroy held the fall semester’s opening Mass there on September 11, as well as the introduction to Founder’s Day on September 29 (see page 4 in the Fall 2016 edition of Regis Today). If you’ve chatted with students who have participated in the Center for Ministry and Service mission trips in the states and abroad, you’ll hear a common phrase: The experience is life-changing. And Regis students learn that service is a way of life. Throughout the year, including summers, the center sends students to areas of the globe to offer “love and service of the Dear Neighbor without distinction,” a core value of the Sisters of St. Joseph. Students participate in everything from home building to community building. This year alone, upwards of 149 students applied to go to New Orleans, Peru, and Jamaica; forty-six students were chosen for those destinations. For 12 years, Regis has been sending upwards of 20 students to Peru each year to the coastal town of Villa El Salvador to tend to infants in a local orphanage and to help the elderly in nursing homes and the community. For more information on service trips and other opportunities for service, contact the Center for Ministry and Service at ministry@regiscollege.edu or 781.768.7027. Among Kilroy’s collaborators is Jeffrie Parrish ’14, a graduate intern in the Center for Ministry and Service, who created “Guys Night” as a way to engage Regis males in open and supportive conversations about life issues and spiritual health. Once a semester, the center sponsors an evening of food, drink, and a featured speaker. All of these projects are designed to build community, one of three core components of the Regis strategic plan. Kilroy lives at St. Anthony Church in Allston and loves to travel, ski (in Austria), cook, and cycle. He has helped lead alumni trips to Ireland and, this past summer, to Italy, where he said Mass in various towns, including Assisi, along the way. Next July he’ll join alumni and friends in the European Alpines for the annual trip. Kilroy presided over President Antoinette M. Hays’ daughter Alexis Przybylski Lawton’s wedding and baptized Hays’ granddaughters, Olivia and Nora. His relationship with President Hays goes back to her youth, when she was a member of one of his parish’s youth groups. When you do make it down to Father Paul’s office, notice the print by painter Pierre-Auguste Renoir above his desk. It’s familiar to anyone who has seen it: “Luncheon of the Boating Party.” The 19th-century Impressionist painter captured friends gathered in joie de vivre around a white-cloth table, drinking wine, relaxed in conversation in the afternoon light.